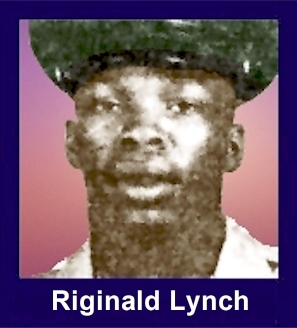 The 35th Infantry Regiment Association salutes our fallen brother, PFC Reginald Wayne Lynch, who died in the service of his country on January 20th, 1967 in Binh Dinh Province, Vietnam. The cause of death was listed as Accidental Homicide. At the time of his death Reginald was 19 years of age. He was from Brevard, North Carolina. Reginald is honored on the Vietnam Veterans Memorial at Panel 14E, Line 57. The decorations earned by PFC Reginald Wayne Lynch include: the Combat Infantryman Badge, the National Defense Service Medal, the Vietnam Service Medal, the Vietnam Campaign Medal and the Vietnam Cross of Gallantry with Palm Unit Citation. Reginald is buried in Coopers Cemetery, Brevard, North Carolina. The funeral was conducted at Bethel Baptist Church in Brevard by Reverend Collin E Rustin. Reginald was a 1965 graduate of Brevard High School. At the funeral the Floral Bearers were girls from the Class of 1965. The Honorary Pallbearers were boys from the Class of 1965 and members of the football team at Brevard. The Active Pallbearers were a detachment from Fort Gordon whom also conducted Military Graveside Rites. The information on Reginald's funeral was taken from a program sent by his Aunt Agnes Wilson who also supplied his picture. Agnes states Reginald was a decent and very wholesome young man who considered it an honor to serve his country. R.I.P. young Cacti.